Our Family has been raising dogs for over 30 yrs. ​We take pride in our dogs and would love to help you find your next Best Friend..
Our goal is to help you find that perfect companion and help inform you about the puppy you choose. We spend time getting to know our puppies and the breed traits. ​We have raised a few different breeds over the years and have picked these to be our favorites. We have always raised Dachshunds. They are a great all around family pet. I grew up with them and raised our children with them. 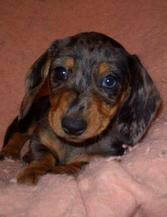 One of our favorites was "Peanut" She was a beautiful Blue Dapple. Puppies are always Handled Daily, watch TV and play with the other dogs. ​If you have any questions Please feel free to contact us, we love visiting with the new families.